It’s Friday, so that means breakfast tacos for the office. 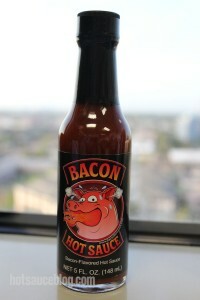 And this week, I could think of no better sauce to try with my tacos then Bacon Hot Sauce. Bacon and Eggs anyone? I picked up this sauce at the local World Market for $2.99 a bottle ($3 less then what it sells for online) and I knew going into it that it would be a novelty sauce. Reading the ingredients had me worried from the get go – that’s a lot of preservatives and not a lot of bacon (yes, there is bacon flavor in there). 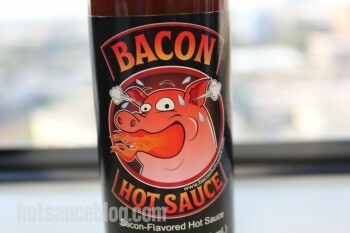 The sauce smells like bacon bits and liquid smoke. And I’m talking about the fake bacon bits. Not a great start, but I poured it on the tacos anyways. 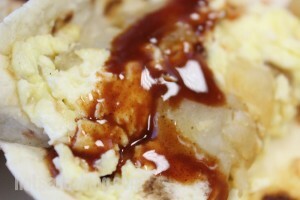 It’s not a bad looking sauce – very thin and almost bbq like in color. I dug into my tacos but after 2 bites I was left wondering where the bacon was in this sauce – it has basically zero bacon flavor. 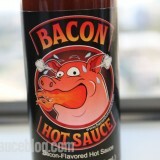 And bacon hot sauce? Well this has almost no heat, unless you count the tingling in my mouth from all the preservatives. Would I buy this sauce again? Yes – but only to keep a sealed bottle on my shelf, the label is pretty great and it is a conversation starter. Would I eat this again? No. A big fat no. My mouth is still tingling and I feel like I need to drink a gallon of water to get the aftertaste out of my mouth. The sauce just isn’t great. There are plenty of other hot sauces and spicy sauces on the market that hit the bacon flavor on the head without tasting like Baco-Bits. Give those a try and skip this sauce. 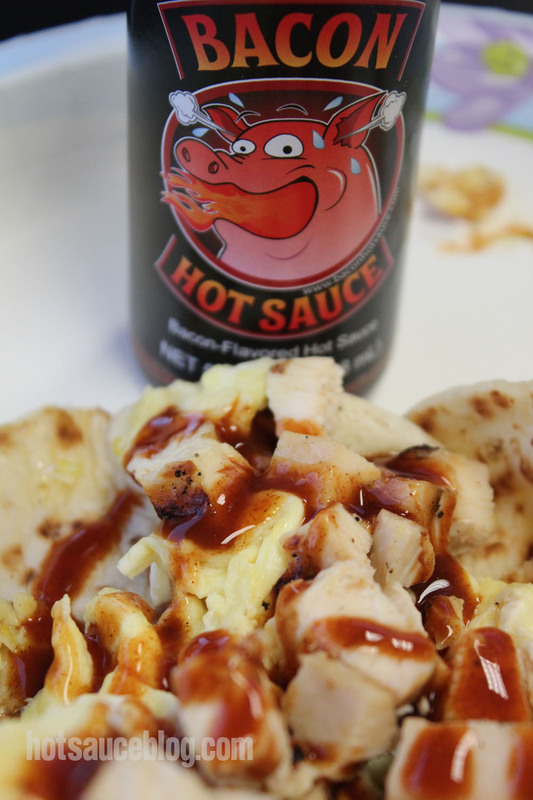 Ancho Mama’s Hot Sauce That’s Not Hot! Btw, I agree wholeheartedly with your assessment. Spot on. This sounds really good… Bacon and Hot Sauce how could you go wrong with that!